River otters are a natural sight on many North American waterways. These social animals' playful behavior provide wildlife enthusiasts seasons of education. 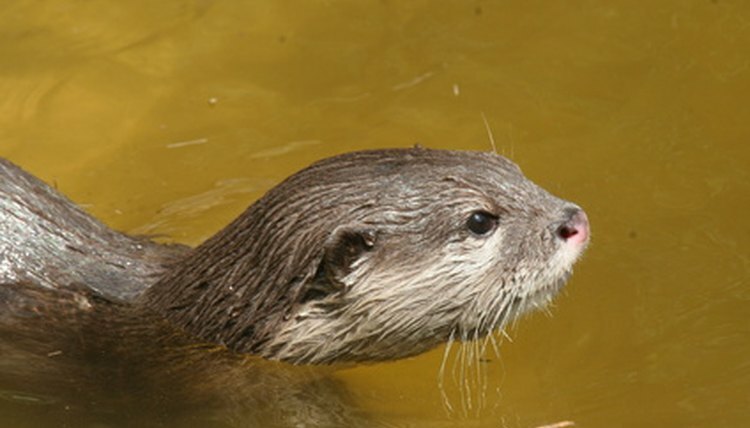 River otters are wild animals, susceptible to diseases such as rabies. As such, you must keep your distance. Wild animals are best left alone. The North American river otter is closely related to the weasel. Adult otters are between 3 feet and 4 feet long; they typically weigh between 10 pounds and 30 pounds. They travel predominantly in water and have few natural predators. River otters are omnivores. They are predominantly nocturnal. It is not unheard of for otters to be seen foraging for food or playing during daylight hours. When on land, river otters are vulnerable to attacks from coyotes, bobcats and dogs. River otters can contract the rabies virus when they are attacked by a rabid predator or by another otter who contracted the disease and become aggressive as a result. River otters have been documented as both having rabies and spreading rabies in the United States. Rabies is an infectious disease that passes from mammal to mammal through bite wounds and scratches. All warm-blooded animals can contract rabies if exposed to the disease. Rabies is untreatable and uncurable. Infected animals are euthanized to prevent its spread. Rabid river otters are not unheard of, but they are rare. River otters are far less likely to contract rabies than raccoons, skunks, dogs, cats and an assortment of other mammals. Only 24 rabid river otters were documented in the State of Florida between the years of 1990 and 2009, according to the Florida Department of Health. The New York State Department of Environmental Conservation reports only three documented cases of rabid otters since 1998. It is likely that a number of river otters contract rabies and die in the wild without being reported. It is unlikely that you will be in close enough proximity to a rabid river otter to note potential symptoms of the virus, unless the symptoms become severe. It is best to leave wild animals alone; avoid getting into close proximity with otters. A rabid otter may be lethargic, weak or anorexic; may be aggressive; may appear to have difficulty breathing and swallowing; may choke; may have open or visible wounds; and may suffer from tremors, seizures or paralysis. If you notice a river otter exhibiting strange symptoms you need to notify your local fish and wildlife department.